Getting there: Take bus 110, 105, 103, 102, 538 or 81 and get off at Wenhuagongyuan (Cultural Park) bus terminal. Walk toward Renmin bridge, and after you go under the bridge you will find the restaurant on your left. It should take about 5 minutes. 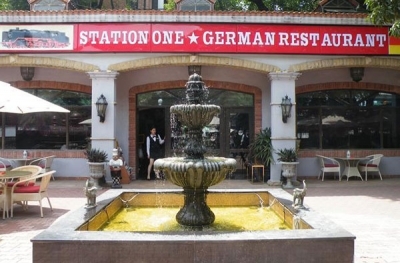 Built inside of an actual train, with nostalgic furniture and lamps, the indoor section of The Original German Restaurant is more popular than the outdoor. However, while not providing much of a riverside view, the fenced open-air section is serene enough lined with flowering potted plants and trees. Besides German food, you can choose between pizza, steak, dessert, wine and beer.